¡Agregaste a The Fab Four a tus favoritos! Te avisaremos antes que los boletos salgan a la venta en tu región. 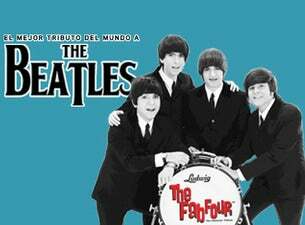 ¡Obtén alertas vía correo electrónico y nunca más te pierdas los eventos de The Fab Four! You know the saying: if it walks like a Beatle, if it talks like a Beatle...it must be The Fab Four, the world's foremost Beatles tribute band. The California-based quartet have been reviving Beatlemania with their spot-on impersonations for over 12 years, and practice has made perfect — the band's tours consistently satisfy the Beatle-shaped hole in fans' souls, drawing rave reviews for their extensively researched, down-to-the-mannerisms enactments of late great band's legendary live concerts. The Fab Four continue to carry on The Beatles' legacy in 2014, hitting the road with their beloved show on a string of North American tour dates. Founded in 1997 by John Lennon impersonator Ron McNeil, The Fab Four spent their early days touring Southern California and playing regular shows at Disneyland. As the band's reputation grew, they landed an increasing number of high-profile gigs, including a headlining slot at Liverpool's annual Beatleweek in 2004 and a residency in Vegas from 2005-2008. Since then, the band has taken their show around the world, keeping the memory of John, Paul, George, and Ringo alive and rocking. "If you like The Beatles' music, and who doesn't, you owe it to yourself to see this band. They talk like The Beatles, they sing like The Beatles, they look like The Beatles, and they play like The Beatles." "Took my 11 y/o son who is the biggest Beatles fan I know to see the Fab Four in Reading, PA. I felt like I was watching THE Beatles live in 2013! They sounded spot on & I loved how they got the crowd involved in the show." ¿A qué evento de The Fab Four asistirás?